The apartment has a single bedroom, bathroom.It is fully furnished with lounge furniture, dining table , and wardrobes in the bedroom. The bedroom has one double bed as well as a vanity table. Some balconies overlooks the swimming pool area. 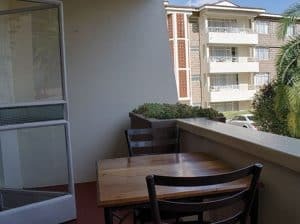 The two bedroom apartment has two bedrooms one of which is a master ensuite bedroom . The apartment has second bathroom and in addition the second bedroom has a double bed. The deluxe two bedroom apartment has the same features as the standard one. In addition it is more spacious and has walk-in wardrobes. The apartment has three bedrooms and two bathrooms. It is fully furnished with lounge furniture, dining table , and wardrobes in the bedrooms. The master bedroom is ensuite and has one double bed as well as a vanity table. The two other bedrooms have single beds and beside tables. A balcony area leading out of the lounge has patio furniture that is perfect for taking an apperitif or watching the sunset. This is a perfect apartment for families with children. The penthouse is found at the top of the West wing. It comprises a spacious master bedroom, a second bedroom, kitchen, dining area,lounge and bathroom.It is fully furnished with lounge furniture, dining table , and wardrobes in the bedroom. The master bedroom has one double bed as well as a vanity table and bedside tables. A balcony area, overlooking the swimming pool, leads out of the lounge has patio furniture. The kitchen comes complete with electric stove, refrigerator with a freezer compartment, microwave oven, cutlery, crockery and cooking utensils. The electric stove has four plates as well as grill and oven. There is plenty of storage space in cabinets both above and below the counter. A small balcony is also found in the kitchen. Keeping in touch is easy with all local tv channels as well as satellite channels. The satellite channels include CNN, Aljazeera and CCTV satellite network channels from the DSTV network.